Tomato oats is a very simple dish similar to tomato rice. I have replaced rice with rolled oats. This dish is low in calories and is great for weight loss. It keeps you fuller for a longer time, reduces your hunger cravings and it is also delicious. It takes just 15 minutes to make this dish with oats. Today we will learn how to make delicious tomato oats with step wise pictures. Place oats in a sieve/colander and rinse it for a few seconds. Drain the water completely and let it sit for 15 minutes. Meantime we will prepare the tomato masala. Heat oil in a pan, add mustard seeds, when it splutters, add finely chopped onion, green chilli and curry leaves. When onion turns transparent, add finely chopped ginger, garlic and saute for a few seconds. Than add chopped tomatoes, turmeric powder, coriander powder, sambar powder and salt needed. Cook until tomato becomes mushy and the rawness of the spice powder goes. Then add the rolled oats, mix well and cook for another 2-3 seconds. Garnish with coriander leaves and serve hot with any raita/pachadi of your choice. Check out more Oats Recipes for Breakfast and Lunch and more Weight Loss Recipes. Note - Use only rolled oats or steel cut oats for this recipe. You will get rolled oats in big supermarkets and also online on Amazon (India). Rolled oats are much healthier than quick cooking oats. Looking forward to making this, and no doubt it will be delicious as your other recipes!! Thanks Padhu! Hi what oats you use??? I used Bob's Red Mill old fashioned rolled oats. My day wont complete without entering into your site. 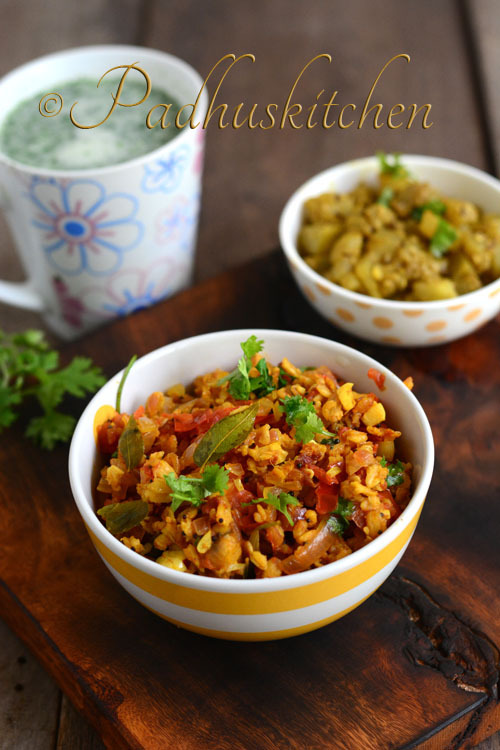 your blog has the most number of healthy dishes... millets, oats ,and quinoa recipes.. They are simple and delicious . I have tried almost all of your millet and oats recipes. I should admit, that you have helped me in losing my post-pregnancy fat in a healthy way . Whenever I think of a new different dish, i would be able to find a recipe in padhuskitchen for that dish.This tomato oats recipe is something like that. i was thinking of tomato oats sadham today and found a recipe in your page for the same. Tried this recipe and everyone liked it.Thank a lot. A small update in the recipe: Mustard seeds addition is not given.. Kindly check please make the changes..
Also could you please let us know why should we use rolled oats or steel cut oats? Thanks a lot for letting me know. Sometimes it happens though I read several times before posting it. I have updated it now. Regarding your doubt - the instant quick cooking oats will become mushy. So I used rolled oats for this recipe.